Saturday, May 5, 2018, 9:00 PM – 11:00 PM. South on Main, 1304 South Main St., Little Rock, AR 72202. You don’t want to miss this amazing Little Rock Cinco de Mayo celebration! This is going to be one of the biggest parties in town. The margaritas will be cool and the music will be hot! This is THE Cinco de Mayo party you want to attend in Little Rock, AR. MarQuis & MOOD, known for their spirited jazz, funk and R&B will be playing an all-funk non-stop set for this blowout of a party. 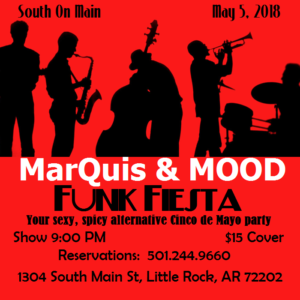 MarQuis & MOOD’s performances always sell out, so call 501-244-9660 today to reserve a table. If the tables are gone, don’t worry, because you’ll be dancing all night, anyway. It’s a non-stop party with upbeat funky music!! It’s MarQuis’ 50th birthday !!! This event will definitely sell out, just like the last performance at South on Main. Don’t be one of the disappointed party goers that couldn’t get a seat and had to stand all evening. For questions, email L A Rose or call 858-480-7673. Tuesday, May 1, 2018, 7 PM – 9 PM. 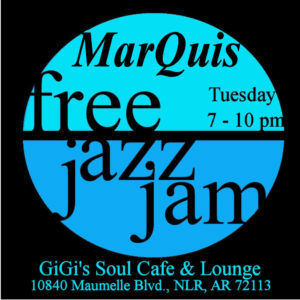 MarQuis Hunt will be hosting a free jazz jam at GiGi’s Soul Cafe’ and Lounge in Maumelle. 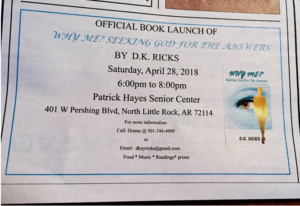 Author D. K. Ricks has written a new book, Why Me? Seeking God for the Answers. Ricks will be signing copies and reading selections at a launch party. The musical entertainment will be provided by MarQuis Hunt of MarQuis & MOOD. There will also be food and door prizes. Thursday, April 26, 2018, 7 – 10 PM. Thirst N Howl, 14710 Cantrell Rd., Little Rock, AR 72223, (501) 379-8189. Free parking. No cover. Don’t miss MarQuis Hunt as he jams with some amazing jazz musicians. This is an incredibly talented, all-star lineup not to be missed, including Curtis Adams, Ivan Yarbrough, Steve Struthers, and others.